Connections are banking on there being a flight made available for their filly Anthemoessa to fly to the Gold Coast before Saturday’s $2m Magic Millions 2yo Classic (1200m). Jordan Childs, above, takes the ride on Anthemoessa in the 2018 Magic Millions 2yo Classic at the Gold Coast. Photo by Adrienne Bicknell. Ballarat trainer Matt Cumani has qualified Anthemoessa for the Magic Millions 2yo Classic with two seconds from two race day appearances but the Smart Missile filly is stranded in Melbourne after she was shunted off her scheduled flight to the Gold Coast on Monday night. “We’ve done the hard part but seemingly the hard part is getting up there,” Cumani told racing.com. Cumani is looking to an alternative plan of chartering his own flight to the Gold Coast which would also accommodate other Victorian trainers who have also been stranded by the late cancellation of their bookings. Leading trainer Darren Weir is among those trainers with Lucky Hussler, Ozi Choice, Nikitas and He’s A Moral all entered for races on the $10 million Magic Millions Race Day on Saturday. “What I am hoping to do is to charter a flight but I need everyone else (other trainers) to agree and ideally I need someone to guarantee the flight,” Cumani said. “He (Weir) might get preference over us because he’s got more horses and he does it (fly to Queensland) a bit more regularly. “Weiry told me from his experience that you are a two in three chance of getting a flight so that’s pretty poor odds if you ask me. “We can’t do much but wait for the call. We try and keep in touch (with airline transport). We tend not to get anything definite until about 10 o’clock at night but we’re ready to go at any time they give us the OK.
Anthemoessa is yet to win a race from two outings but has earned enough prizemoney to make the Magic Millions 2yo Classic field after collecting $36,000 for running second to La Pomme de Pin in the $200,000 Magic Millions 2yo Clockwise Classic (1000m) at Ballarat on November 25 and then picked up another $18,000 for being runner up in an 1100m two year old Plate at Caulfield on December 16. Jordan Childs has retained the mount on Anthemoessa in the Magic Millions 2yo Classic after guiding her into second place at Caulfield and is certain to give her every chance from barrier three in the sixteen horse field. 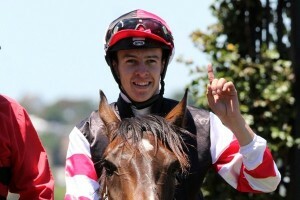 Ladbrokes.com.au have installed Anthemoessa as one of the outsiders of the field at $26 while the David Atkins trained Jonker heads the betting at $4.20.